Diabetic Retinopathy (DR) is the leading cause of blindness among working adults in developed countries such as Singapore and United States. 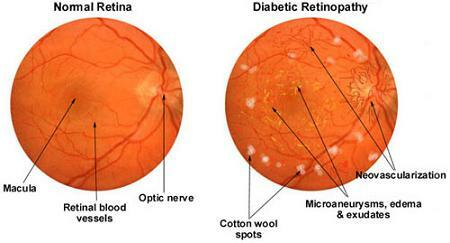 It is a complication of diabetes that affects the blood vessels in the eye. Diabetes is a systemic disease where your body is unable to produce enough insulin or use the insulin properly to normalize blood sugar level. According to U.S. Centers for Disease Control and Prevention, this number will grow to 16 million by 2050! It is possible to have DR without knowing it due to the lack of early signs. As RD progresses, you may discover the following symptoms. If you do, check out with your doctor ASAP. Patients usually develop DR after 10 years of having diabetes (sometimes earlier). Uncontrolled diabetes allows unusually high levels of blood sugar to accumulate in and damage the tiny blood vessels in the eye. Some blood vessels are blocked completely. 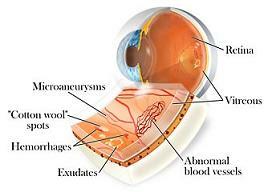 As more and more the blood vessels become clogged, the blood supply to the retina is cut off. To make up for lack of blood supply, the eye attempts to grow new blood vessels. However, these immature blood vessels are feeble and can leak easily. Such leakages cause several complications which may damage the eye’s retina thus resulting in vision loss. 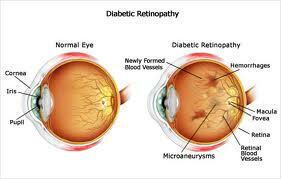 There are two stages of DR.
Also known as background diabetic retinopathy, is the earlier stage of DR. This condition is usually identified by the deposits formed around the retina due to leakage from the blood vessels. This leakage includes blood, extra fluid and fats. It is difficult to know whether one has NPDR as there are often no visual symptoms present. Hard exudates - deposits of cholesterol or other fats from the blood that have leaked into the retina. Macular edema - swelling of the macula caused by the fluid leakage. 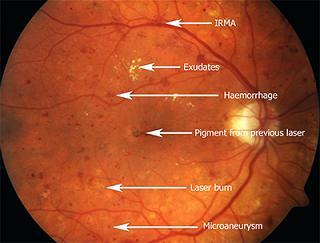 Microaneurysms - small bulges in blood vessels of the retina that often leak fluid. Retinal hemorrhages - tiny spots of blood that leak into the retina. The advanced stage of NPDR which is responsible for most of the vision loss in diabetes. As NPDR progresses into PDR, larger blood vessels become blocked. These blockages can result in areas of the retina becoming starved of oxygen. In order to repair the damage, the eye is stimulated to grow new blood vessels to provide new blood supply of oxygen to the oxygen starved areas. This process is also known as neo-vascularisation. Unfortunately, these new blood vessels are abnormal and frail. They even grow in the wrong places such as on the surface of the retina and into the vitreous gel. As such, these blood vessels can bleed very easily which may result in large hemorrhages over the surface of the retina or into the vitreous gel. In large quantity, the hemorrhages can block light from reaching the retina thus causing vision loss until the hemorrhages are cleared. The leakage can caused more severe complications as the hemorrhages can lead to scar tissue forming which may pull the retina resulting in retinal detachment. If the blood vessels grows in iris (the colored part of the eye), they may block the normal flow of fluid out of the eye. This blockage builds up pressure in the eye and may result into glaucoma, a particularly severe condition that can cause permanent vision loss. I can't stress enough that prevention is better than cure. Why do the fire fighting while you can prevent it from getting started. Control your bad cholesterol level. Control blood sugar within normal limits. Eat grapefruit. They are great at lower your insulin resistance. Make sure you have regular eye exams, especially retinal screening. Maintain a healthy lifestyle with healthy diet and regular exercises (at least 20 minutes daily). Take eye vitamins to provide all the necessary ammos needed by your eye to combat eye diseases. Eat tomatoes as they contain chromium and alpha-lipoic acid that help to lower blood sugar and insulin requirements. If you are interested in the types of treatment available for DA, see my article on Treatment for Diabetic Retinopathy.